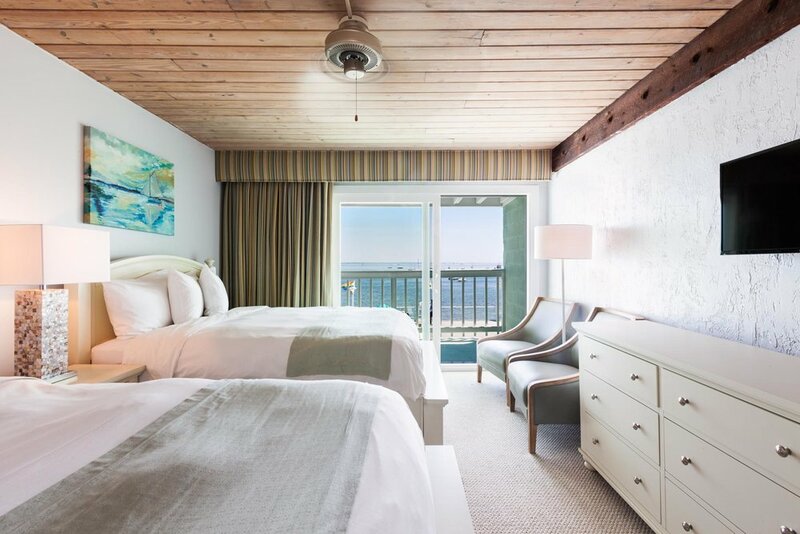 Enjoy beautiful waterfront views of Cape Cod Bay. Waterfront double rooms feature two double beds and a large balcony. Parking not included. Check-in time is 2 pm and check-out time is 11 am, sorry we cannot provide early check-ins or late check-outs. The deposit for your reservation is a one night minimum, or 50% of stay, whichever is greater except during peak periods as stated below. Reservations cancelled less than 15 days from date of arrival will result in the forfeiture of deposit. The deposit for Fourth of July, Bear Week and Carnival is 100% of your stay and is non-refundable. Rates do not include state and local tax. Rates are for one or two people per room. There is a maximum number of four people per room in rooms with two beds and a maximum number of two people per room for rooms with one bed. There is an additional charge of $35 for each extra person each night. Our hotel cannot accommodate pets at this time. Since all areas of our beach club, including lobby, pool, deck & grill, serve alcohol, we have a strict policy that all guests at our hotel must be 21 or older. We do request photo ID upon check-in and unfortunately, we cannot make exceptions. © 2018 The Boatslip Beach Club. All rights reserved.